If your doctor has recommended a wedge resection for lung cancer, you are likely wondering what the procedure is like and how it is different from other types of lung cancer surgery. When would a wedge resection be recommended over other procedures and what are some potential complications? What are some of the reasons why a wedge resection may be considered instead of a lobectomy, and when would it not be recommended? A wedge resection involves the removal of a lung cancer along with a wedge-shaped section of tissue surrounding the tumor. This procedure removes less lung tissue than a lobectomy (a procedure in which a lobe of a lung is removed) or a segmentectomy (a procedure that removes a larger portion of the lung than a wedge resection, but not an entire lobe as in a lobectomy.) 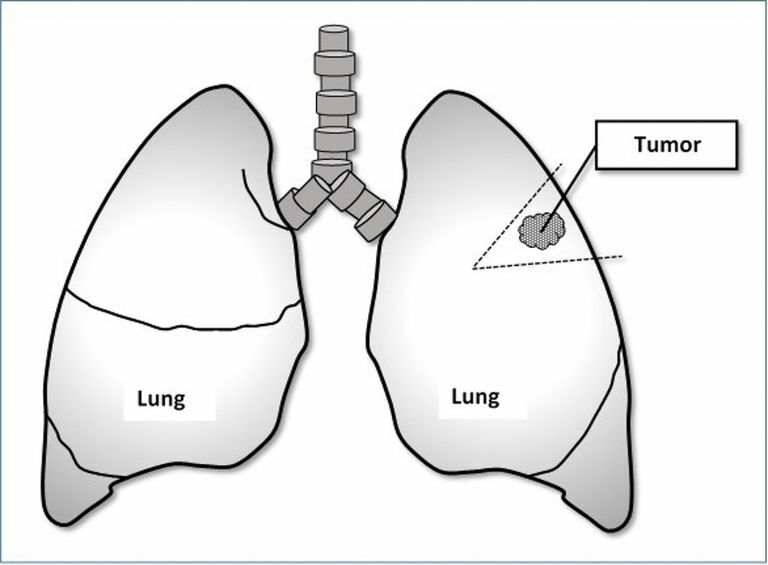 When looking at the illustration note that the right lung has 3 lobes and the left lung has 2 lobes. A wedge resection is also referred to as a sub-lobar resection, as is a segmentectomy. In looking at other terms you may see the procedure referred to as nonanatomic in contrast to other procedures which are anatomic, meaning only that it does not involve removing a distinct piece of anatomy. The procedure is most often considered if a tumor is less than 4 cm (roughly 2 inches) and ideally less than 2 cm in diameter, is located on the outer parts of the lungs (the periphery,) and is classified as stage 0, stage 1A or a small stage 1B non-small cell lung cancer. Based on the TNM classification of lung cancer, these tumors would be T1N0M0. Sometimes the procedure is done as a lung biopsy to evaluate suspicious findings (ground glass opacities or other suspicious lung nodules). The procedure may also be done for noncancerous lung conditions, such as tuberculosis, aspergillosis, and removal of emphysema blebs. With other cancers, the procedure may be done in order to remove isolated metastases to the lung from breast cancer, melanoma, and a few other cancers (such as renal cell cancer, colon cancer, and sarcomas) that spread to the lungs. When a wedge resection is performed for people with lung cancer, it is most often done for people who would not tolerate having an entire lobe removed, such as older people with lung cancer, people with other serious medical conditions, or those who have compromised lung function. When this is the case, the goal is to remove the tumor while preserving as much lung tissue as possible. Of note, is that older people with lung cancer often tolerate the treatments for lung cancer as well as younger people with the disease. In one study, even older patients who underwent a pneumonectomy (removal of an entire lung), showed no difference in the ability to tolerate the procedure. A 2018 study also found that elderly people with lung cancer (those over the age of 80) tolerated surgery as well as younger people. The study did, however, find that segmentectomy (wedge resection) was associated with better outcomes than more extensive lung cancer surgeries. Another possible reason for considering this procedure is a personal choice. Some people choose a less invasive procedure such as this for quality-of-life reasons and accept a somewhat higher risk of lung cancer recurrence. Tumors larger than 4 cm cannot usually be removed via a wedge resection. The location of the tumor may also make this procedure impractical. In general, a more involved procedure such as a lobectomy is often recommended for young, otherwise healthy, individuals, although that may change in light of a recent review of studies (see under prognosis below). Imaging studies to evaluate the location and extent of the tumor, as well as to look for possible cancer in the lymph nodes and distant regions (such as the liver or bones). A wedge resection can be done either through a thoracotomy (open chest surgery) or via video-assisted thoracoscopic surgery (VATS). VATS is a less invasive procedure, but not all surgeons perform this surgery and it is not always possible based on the location of the tumor. Depending on which procedure is performed, the surgeon (after entering the chest) locates the tumor. A careful exam is done evaluating the lungs and nearby lymph nodes. The tumor is then removed with a small amount of tissue surrounding the tumor. The surgery may be combined with brachytherapy, a procedure in which radiation is applied during surgery directly to the site of the tumor. Following surgery, the length of time you are in the hospital will depend on what type of procedure is done (VATS vs open thoracotomy) and your progress during recovery. A chest tube is placed in your chest during surgery, and usually, stays in place for 24 to 48 hours. During this time a respiratory therapist will visit with you, encouraging you to take deep breaths to reduce the risk of infection. When you are discharged to home your surgeon will give you specific instructions for follow-up and provide you with a prescription for medications to ease any pain you have when you return home. The prognosis of a wedge resection will vary depending on your particular tumor, your general health, and other treatments you receive. It was thought for a long time that survival (in people who could tolerate the procedure) is higher in people who undergo a lobectomy vs a wedge resection. A recent review of 54 studies looking at close to 39,000 patients has changed that thought. For people who had a wedge resection but could have tolerated a lobectomy (a group in which wedge resection was "intentionally chosen,") the survival rate was not significantly different between the two procedures. For people who had a wedge resection because they would have been unable to tolerate a lobectomy (a group labeled the "compromised" group,) survival was significantly worse in those having a wedge resection. A wedge resection, though less extensive than a lobectomy or pneumonectomy, is still a major surgery. Ask for, and let, your friends and family help you. Pulmonary rehabilitation after lung cancer surgery has only recently been studied but can make a significant difference in quality of life for some people. Since this is a fairly new concept, you may need to ask your doctor for a referral. Ambrogil, M. et al. Wedge resection and radiofrequency ablation for stage I nonsmall cell lung cancer. European Respiratory Journal. 2015. 45(4):1089-109. Cao, C., Chandrakumar, D., Gupta, S., Yan, T., and D. Tian. Could less be more? - A systematic review and meta-analysis of sublobar resections versus lobectomy for non-small cell lung cancer according to patient selection.Lung Cancer.2015. (Epub ahead of print). Chambers, A., Routledge, T., Pilling, J., and M. Scarci. In Elderly Patients With Lung Cancer is Resection Justified in Terms of Morbidity, Mortality and Residual Quality of Life?. Interactive Cardiovascular and Thoracic Surgery. 2010. 10(6):1015-21. Stamenovic, D., Messerschmidt, A., and T. Schneider. Surgery for Lung Tumors in the Elderly: A Retrospective Cohort Study on the Influence of Advanced Age (Over 80 Years) on the Development of Complications by Using a Multivariate Risk Model. International Journal of Surgery. 2018. 52:141-148.